Daniel Harding | Music Matters | Because it does. Doesn't it ? Music Matters | Because it does. Doesn't it ? 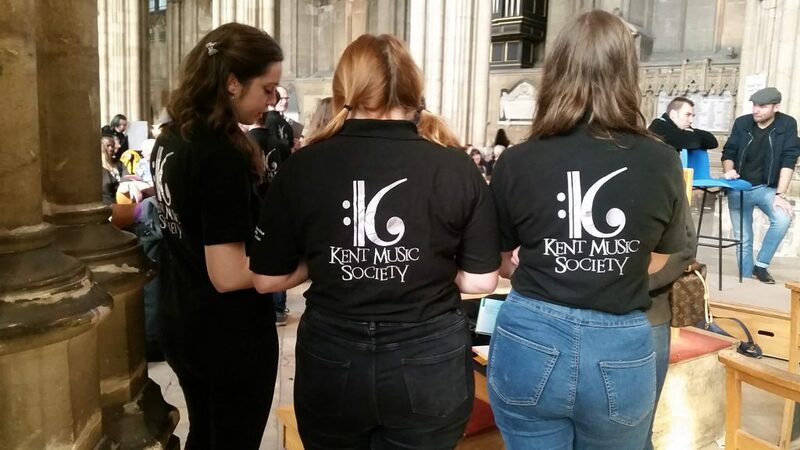 Deputy Director of Music, University of Kent: pianist, accompanist and conductor: jazz enthusiast. 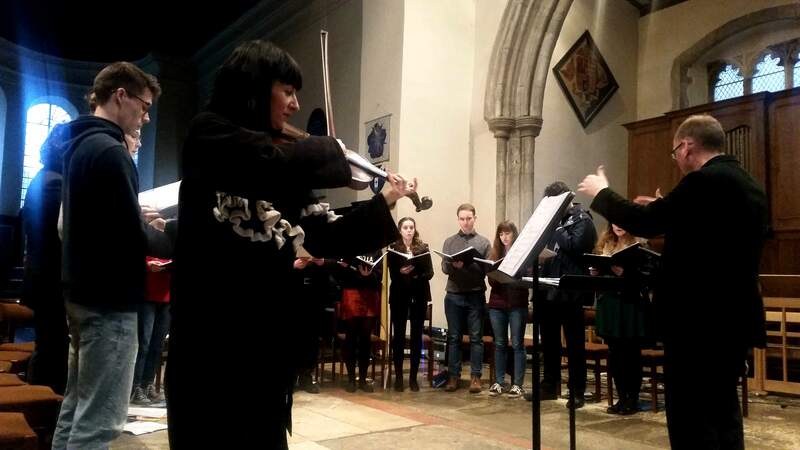 During the Easter break, Žaneta and I attended an orchestral course in Shropshire called Easter Orchestra Week. It was a week of intense and challenging music making with a huge orchestra of like-minded music lovers. The list of music for the week was extensive; there were four main works that were rehearsed each morning, and in each afternoon and evening rehearsal we would sight-read through one or two works. 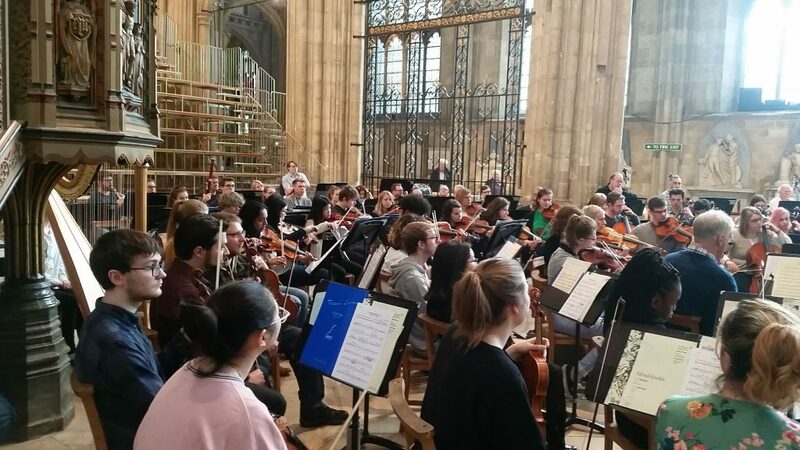 The four main works were performed in an informal concert on the last afternoon. These included From the House of the Dead suite from a ballet by Janáček, which uses chains in the percussion section to represent the chains of the prisoners where the work is set. The second was Symphony No. 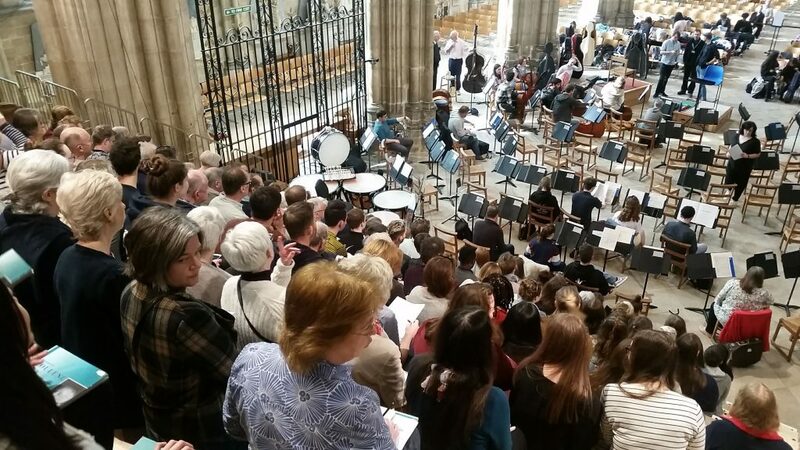 3 by Arvo Pärt; between the second and third movements was a thunderous cadenza for the timpani (obviously milked to its fullest extent) which took the rest of the orchestra completely by surprise on the first play through. The third work was Concerto Festivo by Andrej Panufnik. This was challenging as the meter changed every couple of bars. I was talking to the musical director at breakfast one morning and he said that the composer was fascinated by trains, and while traveling would have ideas and write them down- but had forgotten exactly the time signature of the part he had written before, hence the constant changes from ¾ to 3/8! The final work was the famous tone poem by Strauss, Till Eulenspiegel, the story of a practical joker and possibly the most technically difficult but rewarding of the four works. All four of these I grew to love as the week went on. 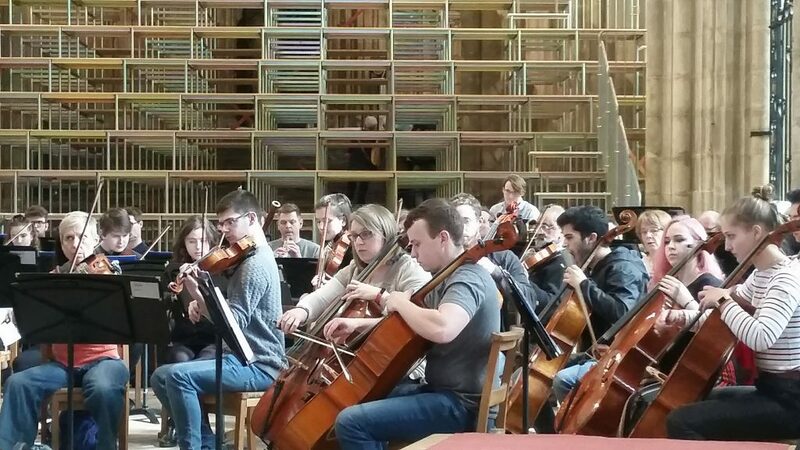 In the afternoons and evenings, we sight-read through many of the most famously difficult pieces in the orchestral repertoire, including the ballet Daphnis and Chloé by Ravel and Shostakovich’s Symphony 12. Most of these sessions I spent clinging on for dear life in the viola section and praying that I didn’t make my debut as a soloist in one of the rests. One of my favourite pieces of the week was Rodion Shchedrin’s Naughty Limericks; a piece full of humour. 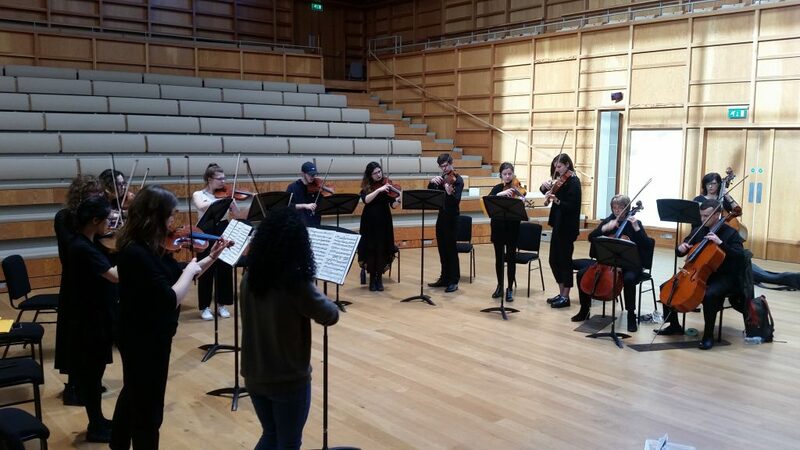 One moment of the piece required the player at the very back of the viola section to play the first violin tune in the wrong key as loudly as possible at one of the few quiet moments. 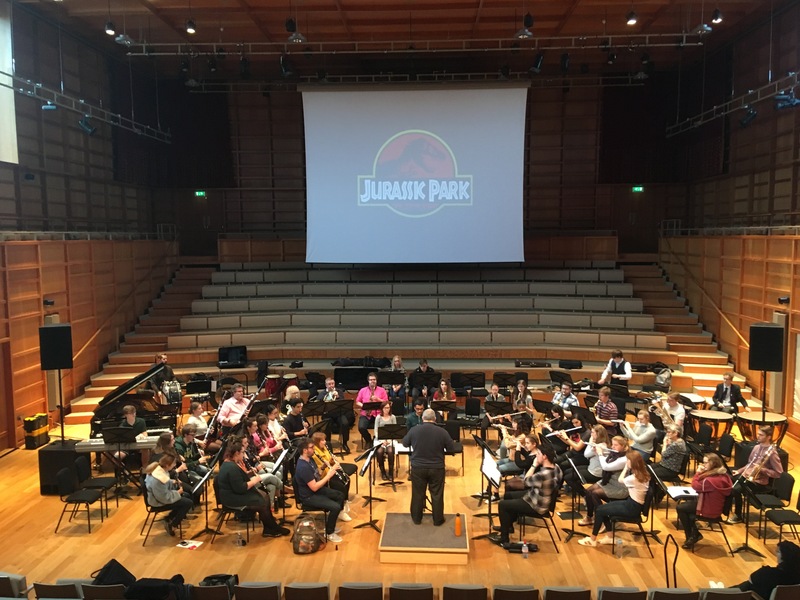 The final evening before the performance brought some light relief with film music including ‘Raiders of the Lost Ark’ and ‘The Good, the Bad and the Ugly’. 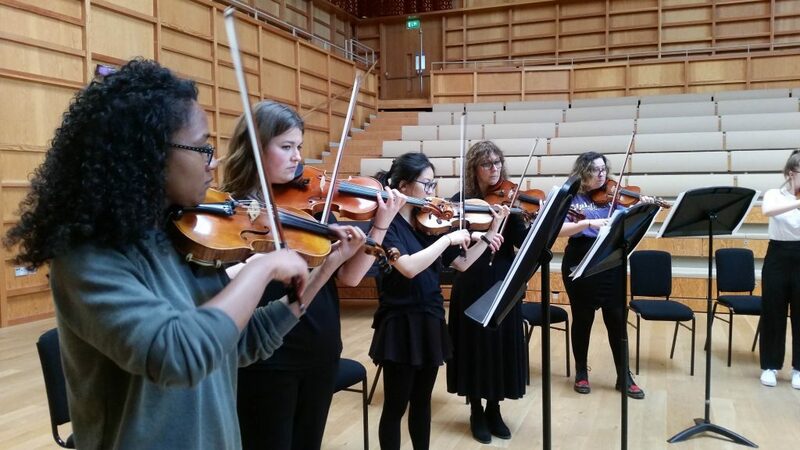 In these sessions we also had the opportunity to sit in different seats and sections, so I was able to play violin as well as viola through the week, and people had the chance to play concertos or sing as soloists. 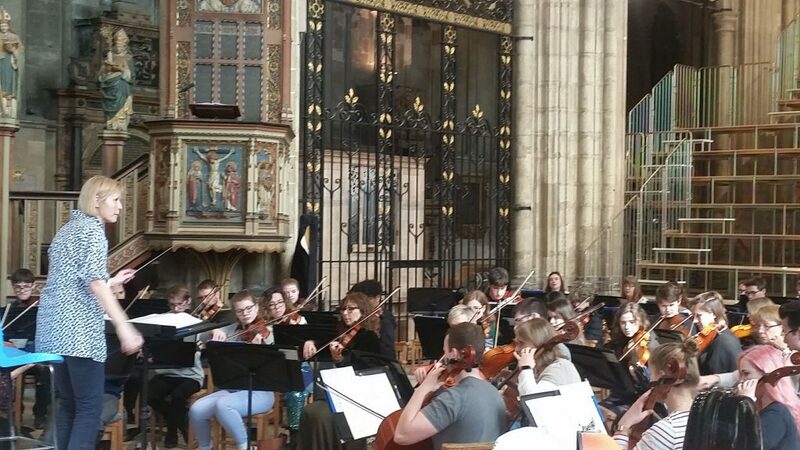 The conductors and the leader of the orchestra were incredible from start to finish in the week- being able to tackle such repertoire was an experience I will not forget, and they made even the most difficult pieces enjoyable and (almost) playable! After lunch we had free time which some people used to play through chamber music. I had the chance to tick many pieces off my bucket list; I was able to play Mendelssohn octet, a Dvorak string quintet and the Smetana quartet (which may have the best opening tune for viola of any quartet I have heard) among others! It was wonderful to be around so many like-minded people who were capable of and exited to sit down and read through pieces. The location of the course was perfect- in a school in the middle of the beautiful Shropshire countryside, which others used the free time to explore. Even though the music from the week was great, it was the people on the course which made it so much better. 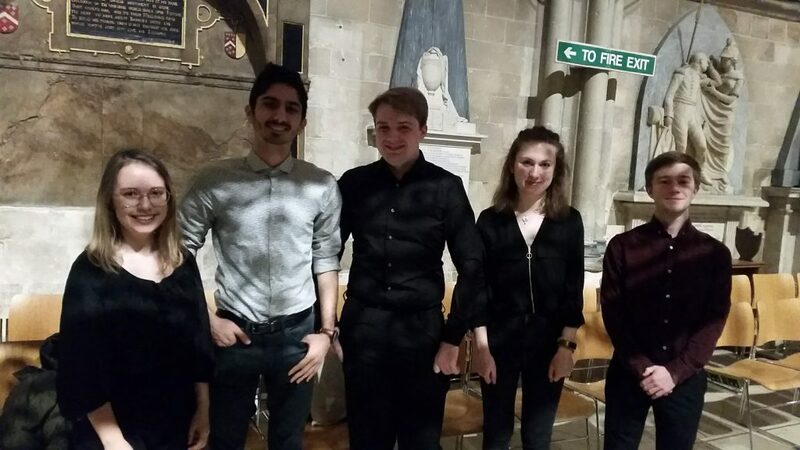 There was a wide range of ages and professions of people and getting a chance to speak with more experienced members of the orchestra was a real privilege. The atmosphere was so friendly; Žaneta and I went down to breakfast on the first morning and sat on a table of strangers-who all spoke to us as peers and friends. Every evening exhausted from the day of rehearsing we would head to the bar and get to know the other members over a few too many glasses of wine. I was lucky enough, as well as 5 others, to be given a scholarship. The others quickly became our close friends, and as always in the music world, we found out we had mutual friends. 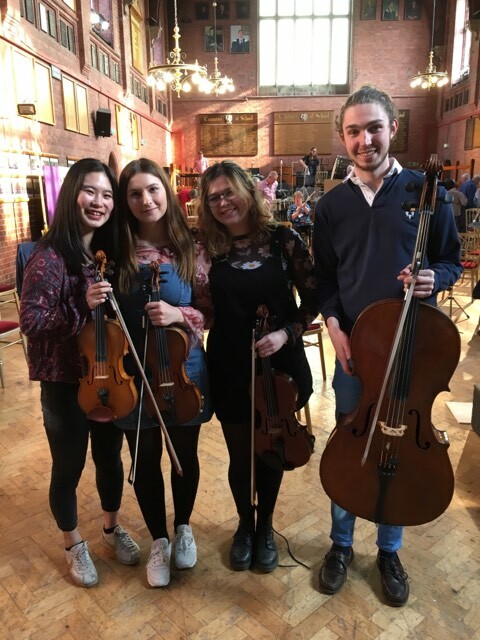 It was a brilliant opportunity to experience music that as an amateur musician you would not get the chance to play anywhere else. 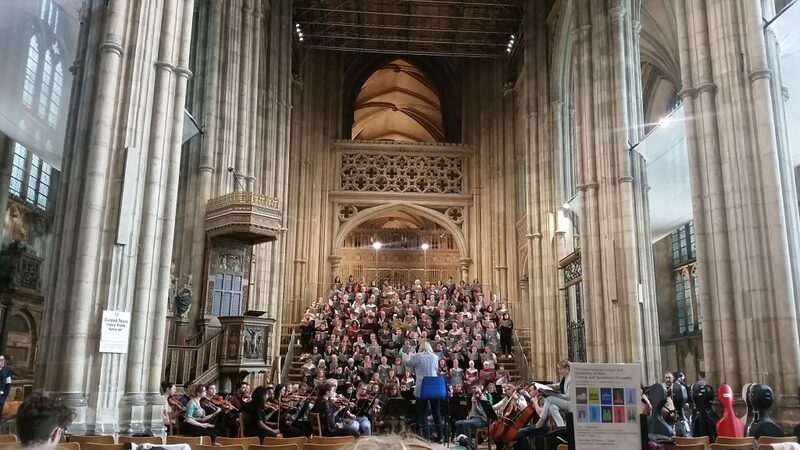 I remember sitting in the first rehearsal and feeling amazed that so many people who do not work in music were meeting together to spend a week of their life playing music purely for the enjoyment, inspiration and challenge that comes from it. I feel that my sight-reading has definitely improved as a result of playing so many challenging works, as well as the ability to convincingly pretend that I know where I am. Many of the members had been going back every year for many years, and I hope to be able to go back again next year too! 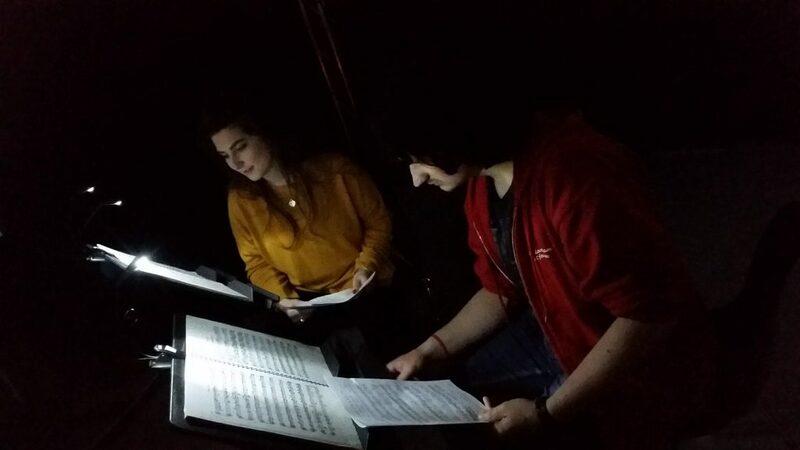 Between Worlds is an exciting new inter-disciplinary project which brings together music, science, film, live media projection and performance in the form of a new piece for choir and ensemble by composer and performer, Anna Phoebe. 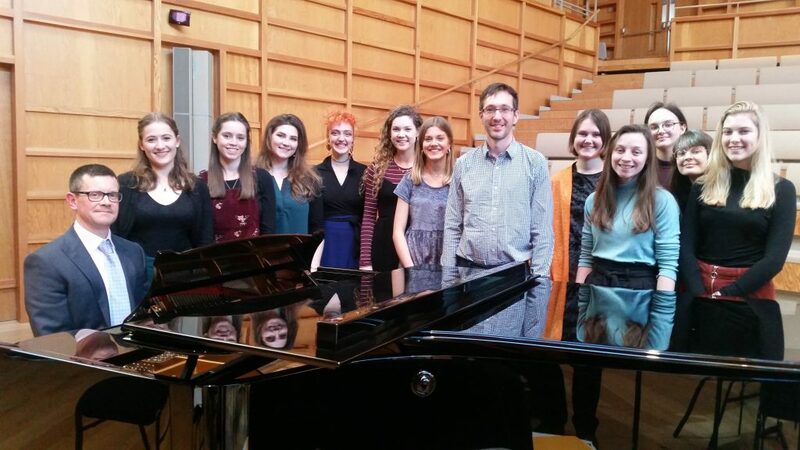 Written for the University of Kent Chamber Choir and String Sinfonia, the piece is a direct, original musical response to spectacular visual imagery provided by research at the University’s School of Biosciences, and to the scientific environment in which is is conducted, drawing on hi-resolution spectroscopy, video evidence and even sampled sounds from the laboratory. 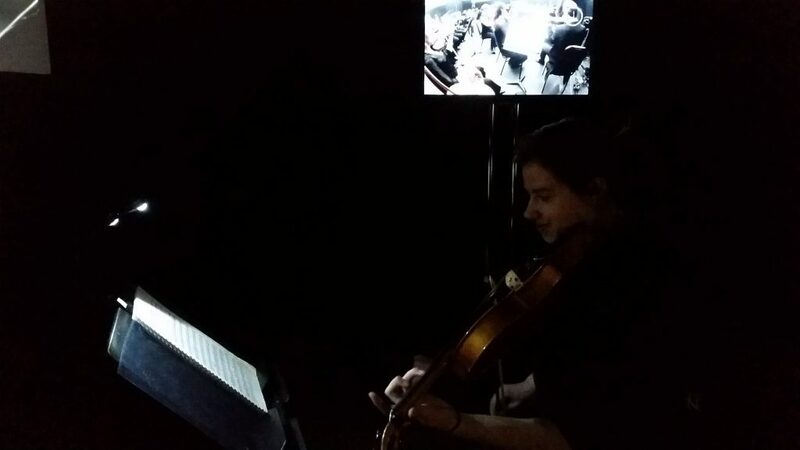 Bringing together a combination of disciplines, the mixture of live music, projections and performers forms a new, highly creative approach to engaging audiences with cutting-edge scientific research data; the project presents images and film generated by exploratory research at the sub-molecular level. 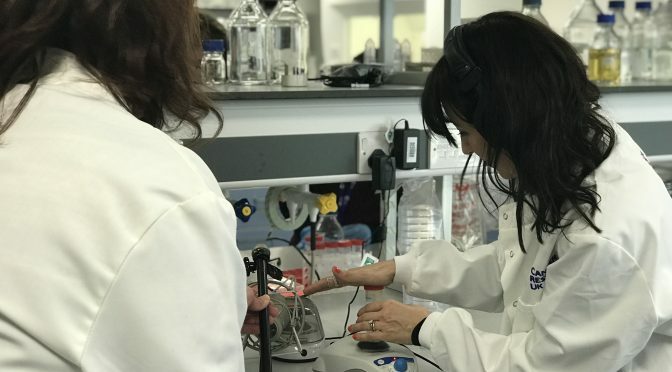 Field recordings from the laboratories at the University are also incorporated into a mesmerising soundscape clothing the live musicians, forming an evocative sonic backdrop to stunning research imagery. 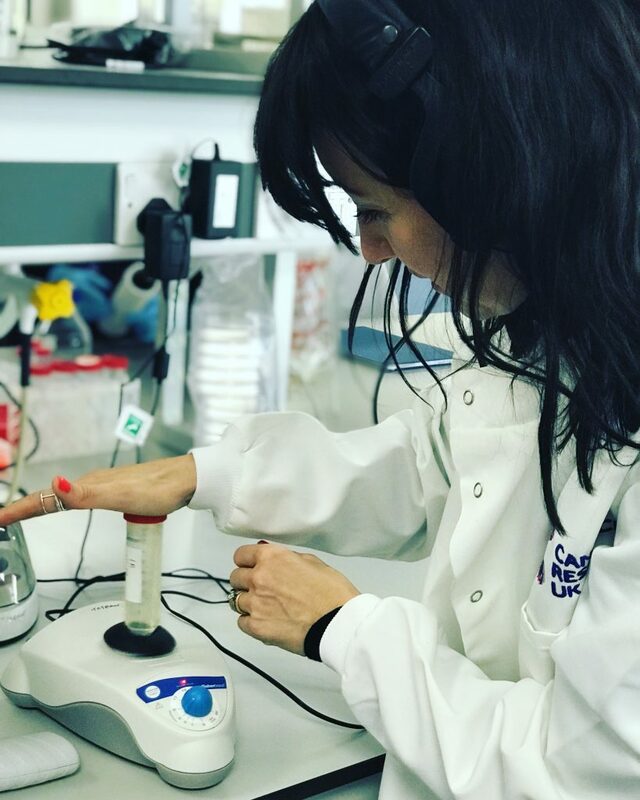 The research, led by Dr Chris Toseland, explores Gene Expression, and is used to combat diseases. 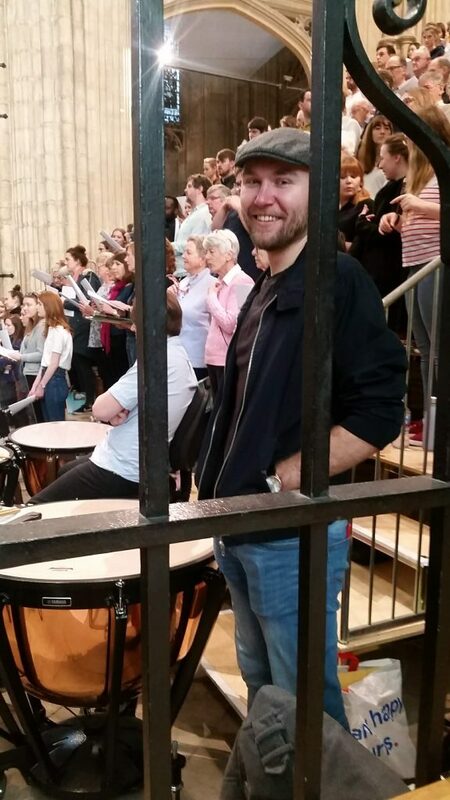 Funded by Cancer Research UK, Chris’ research is the inspiration behind the 38-minute work for choir, solo violin, string ensemble, synthesiser and percussion. 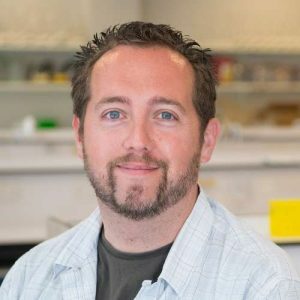 Chris received a BSc (Hons) in Biochemistry from the University of Wales – Aberystwyth in 2006 then commenced a PhD at the MRC National Institute for Medical Research – London. He received his PhD in 2010 from the University of London. His thesis focused upon the biochemical and biophysical characterisation of DNA helicases. At the end of his PhD, Chris was awarded an EMBO Long Term Fellowship to move to the Ludwig Maximilians Universität – Munich to work on single molecule studies with myosin motors. After 3 years he relocated to the Max Planck Institute of Biochemistry with a research focus on genome organisation. Chris joined the School of Biosciences in 2015 as a Leverhulme Early Career Fellow. In the same year he was awarded a highly prestigious MRC Career Development Award to establish his research group. 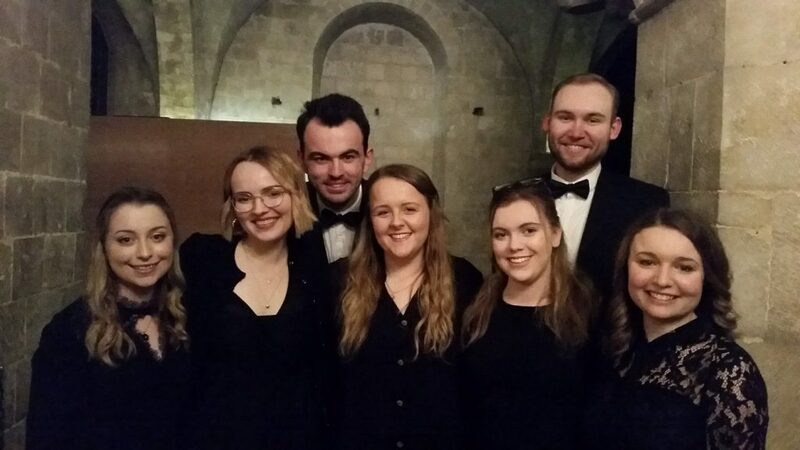 The University Chamber Choir, directed by Deputy Director of Music, Dan Harding, has been working with Anna since January, and performed three a cappella choral movements from the piece as part of a recent concert the Choir gave in Wye, for which they were joined by Anna on solo violin. 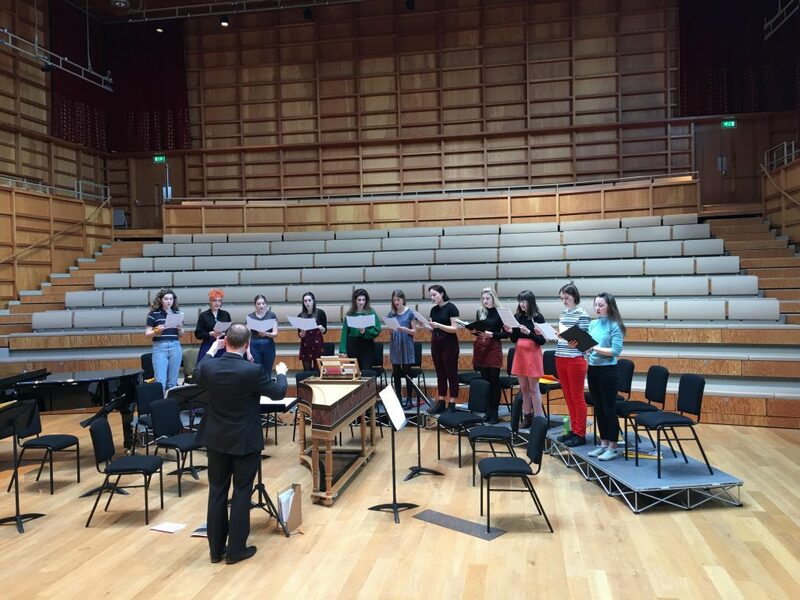 The premiere of Between Worlds in its entirety, complete with live projections and electronic soundscapes, will be given on Friday 7th June 2019, in the spectacular surrounding of the University’s Colyer-Fergusson concert-hall, conducted by Dan Harding, as part of the Music department’s annual Summer Music Week festival. For tickets and event details, click here. 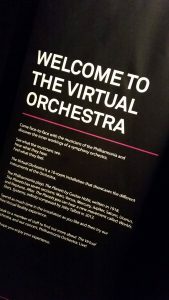 The Virtual Orchestra is currently ensconced in Canterbury, an immersive digital experience evoking the feeling of being a part of the Philharmonia as it performs Holst’s epic The Planets suite. 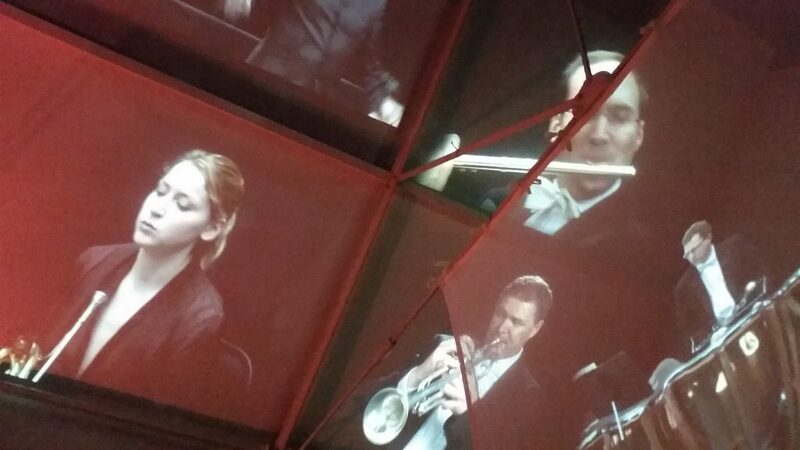 The installation breaks the orchestra up into its various sections, and visitors can tour round a filmed performance to see and hear the physicality of performing. 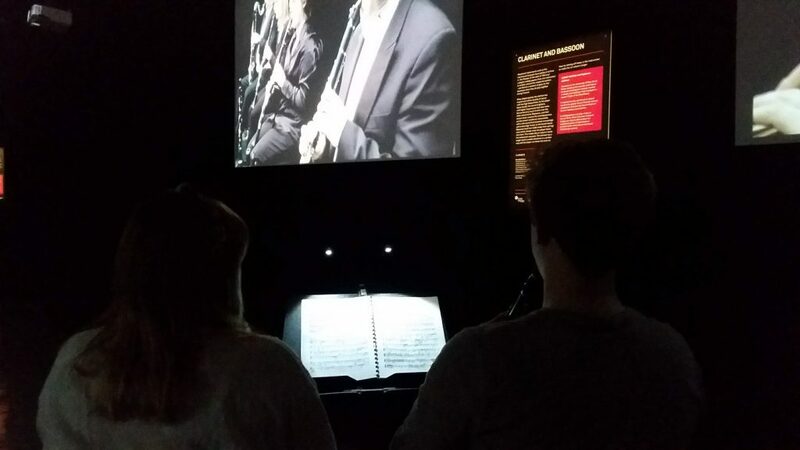 Several of us took the opportunity yesterday afternoon to escape from the pressure of looming academic deadlines and visit the exhibition, housed in the back of the Sidney Cooper Gallery on the high street, with the student players taking their instruments with them – the installation has mock orchestral desks set up around the various sections, with sheet music, allowing you to play alongside the performance. 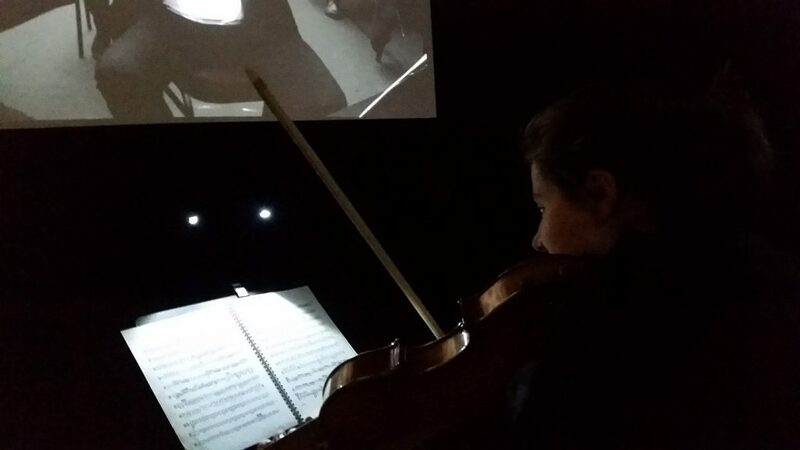 Each ‘room’ in the installation focuses both visually and aurally on the various orchestral sections – strings, woodwind, brass, percussion – with the orchestral sound weighted in order to favour the respective instruments. Lit by the solitary LED stand-light and the glow from adjacent screens featuring the various orchestral musicians in action, it really is an immersive experience. Members of the public visiting the installation also stopped to listen to the students playing; there was a lovely moment where a girl of about three or four was dancing along with the string-playing students, being filmed by her delighted parents! Our thanks to Event Manager, Carys, and assistant Tom for making us welcome, and well done to our own Guardians of the (musical) Galaxy for participating. International Impact, Keeping It Real: reviews. Congratulations to everyone involved in last Saturday’s annual Colyer-Fergusson Cathedral Concert; to all the performers in the University Chorus and Symphony Orchestra, the stewards, those working behind the scenes, conductor Susan Wanless and soprano soloist, Rachel Nicholls. 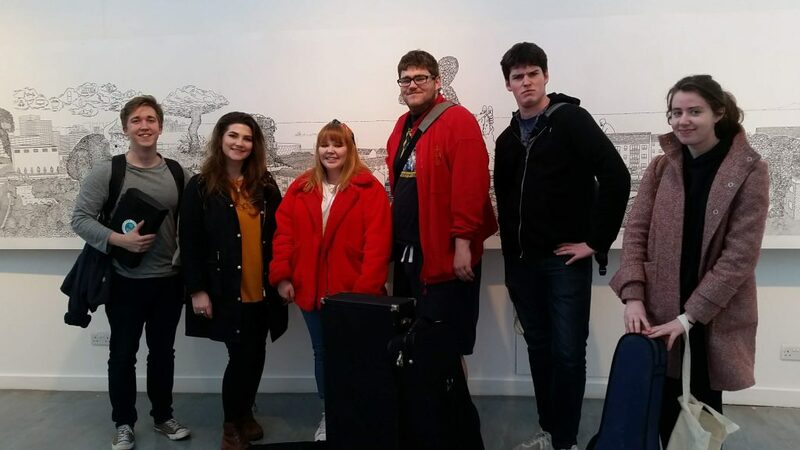 The early shift: Alice, Fleur, Tom, technician Marc and Estates member, Mark. 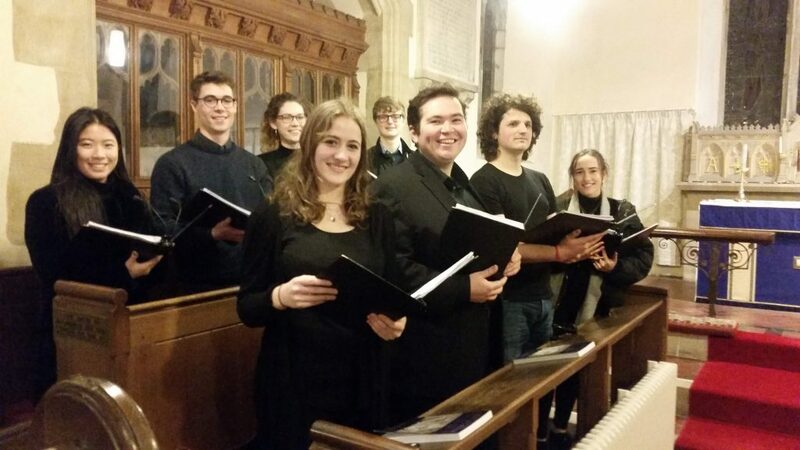 Some familiar faces back to take part: Alice H, Charlotte, Ben, Ruth, Alice B, Cory and Alice Sh! 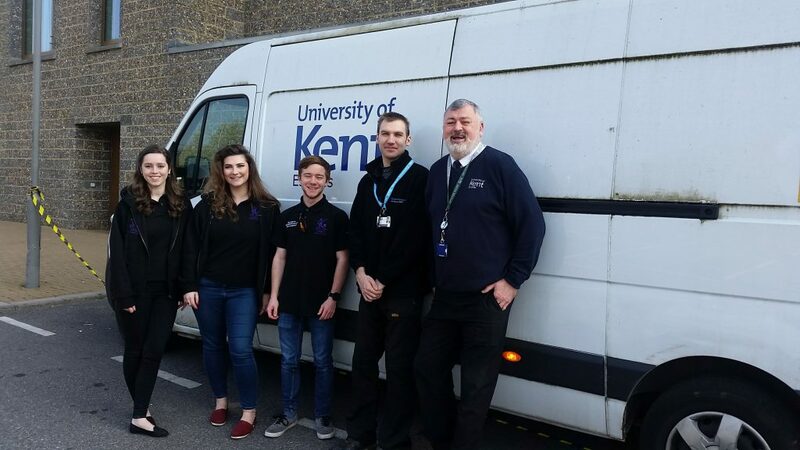 Continuing the series profiling current Music Performance Scholarship and Music Award holders at the University of Kent. 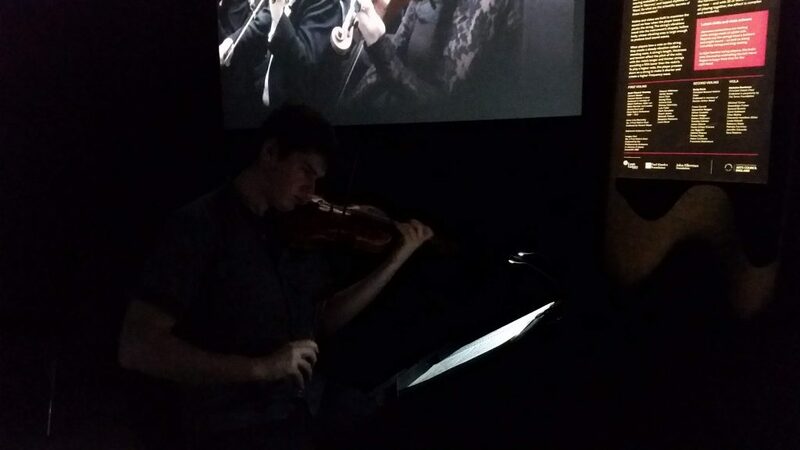 This week, first-year Biochemistry student and Music Performance Scholarship brass-player, Euan Bonnar. My musical journey began very early, aged four, with piano lessons at school. Although it would eventually become a secondary instrument later, I immensely enjoyed being able to learn and perform what were initially very complex pieces for such a small person. Looking back, it is easy to see that my love for the piano sparked my passion for music, with endless hours spent either hammering out scales or a wide variety of pieces. I vividly remember my eccentric piano teacher at the time handing me Bach’s ‘The Well-Tempered Clavier,’ telling me to take a look and play around with some of the pieces. Much of my early musical life was spent pursuing a solo venture, rather than any ensemble playing. The closest I got to playing with other musicians on the piano was performing in the Portsmouth Music Festival with my brother, who ironically is now a much better pianist than I ever was. I picked up the Baritone as a second instrument halfway through Junior School and began to play in the school’s orchestra. Although the sound produced was crude in retrospect, I enjoyed playing with the type of ensemble and would return to playing in this setting much later in the form of brass ensembles, dectets and concert bands. Throughout the rest of my school years, I learnt both instruments at the same time. However, there came a point where I had to choose a primary instrument to focus my efforts on as my workload increased. As I had recently achieved Grade 6 in the piano, I decided to put it on the back burner and continue with the Euphonium as my primary instrument. As I was learning outside of the school system, my only ensemble playing was with the school orchestra. 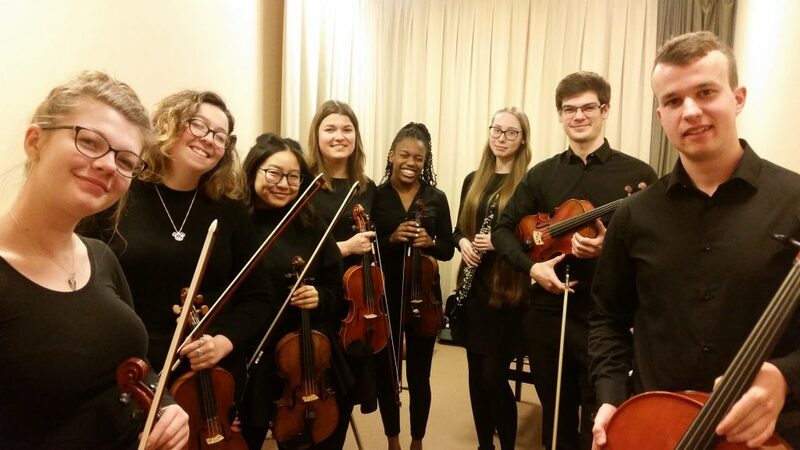 However, in the final weeks of secondary school, I spoke to Jock McKenzie about my plans for ensemble playing at Sixth Form, and if I would be interested in joining his ensembles in the new academic year. Having been playing with his student and orbiting his ensembles for the past five years, I couldn’t wait to play in the calibre of the band that he conducted. 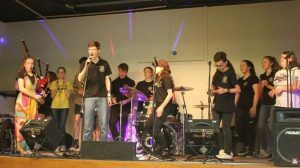 During my time at Sixth Form, I joined in on every musical opportunity I could; taking AS Music, joining the Porchester, Gosport and Fareham Youth Band and the Sixth Form’s Dectet. 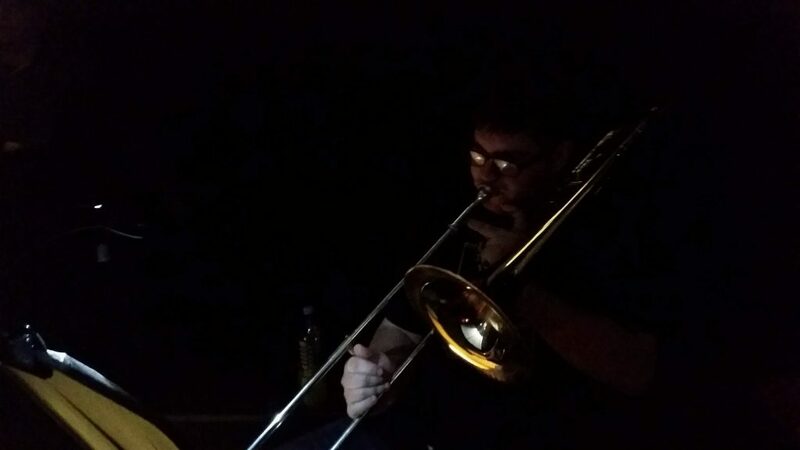 Although I had come very late to the party in terms of ensemble playing, I grabbed every opportunity with both hands and learned a completely new way of playing my instrument. The PFGYB played an amazing variety of pieces which vastly expanded my appreciation for music, and although I missed my solo opportunity in Holst’s ‘Second Suite in F’ in the summer concert as I was on the way back from my Gold DofE expedition in Snowdonia, it still was an extraordinary experience that I will never forget. A highlight of my time playing the Euphonium was when I was invited to participate in the ‘Low Brass Day’ at the Royal Marines School of Music in Portsmouth, hosted by the British Trombone Society. 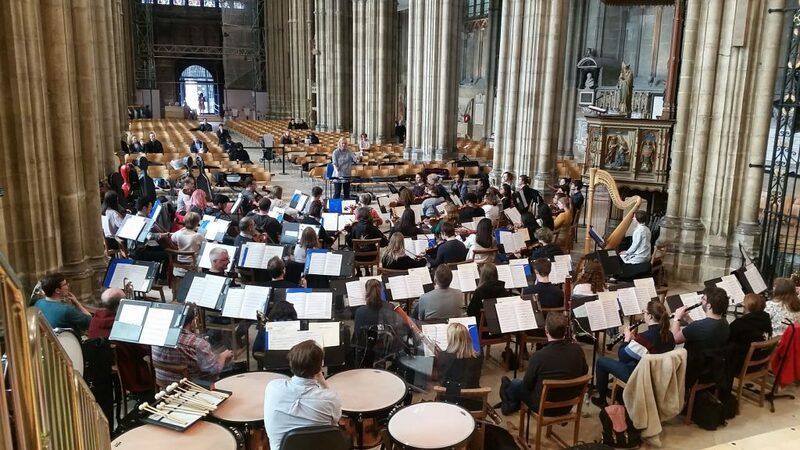 This day was attended by professional musicians including David Childs, Les Neish, Simon Minshall, Robbie Harvey, as well as many members of the Royal Marines Band School. The day included masterclasses from the invited professionals and was based on a variety of techniques and topics and was truly a one-of-a-kind experience. 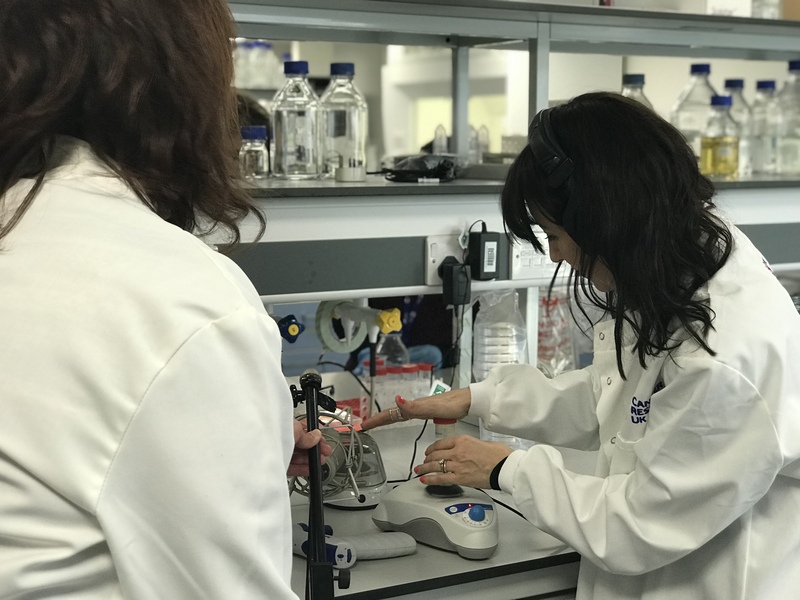 As a biochemistry student here at Kent, I enjoy music as an extra-curricular activity as a way to stay in touch with my creative side between lectures and long periods of study. 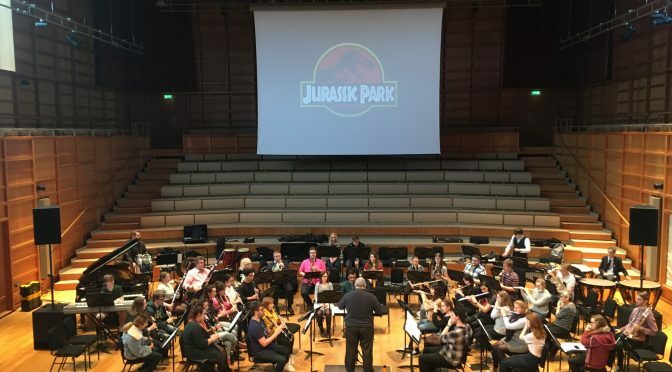 I take part in the University’s Concert Band (pictured in rehearsal, below) and Pops Orchestra but have also formed my own Brass Ensemble to continue to play the type of music that I played in the brass. 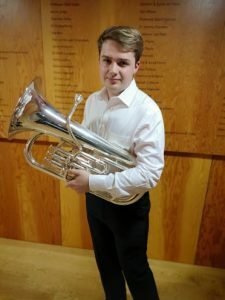 I am very grateful to be the recipient of the Music Performance Scholarship, which has allowed me to purchase a new euphonium to use at University and continue to fuel my passion for music alongside my studies. 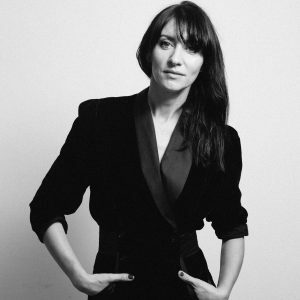 I was encouraged to explore music from an early age and initially started playing the piano when I was six, as well as singing in a local choir. 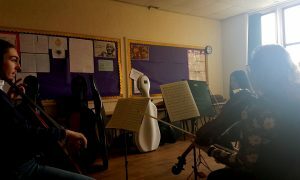 On changing schools, a year later, I was lucky enough to receive cello lessons, which got me interested in strings and I took up the violin soon after. There is a family connection here too, because my great, great grandfather made violins and I feel very privileged to own a violin that was made by him. 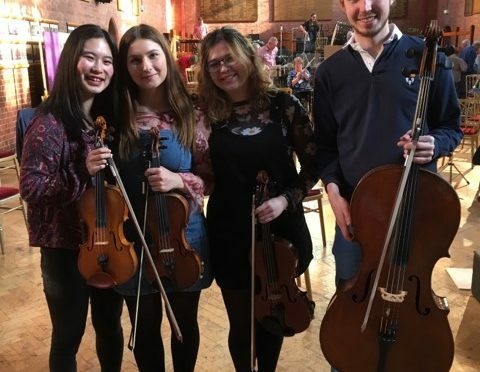 My family live in Salisbury, which offers fantastic opportunities for young musicians and as well as taking lessons, I was able to pursue my musical interests by joining Salisbury Area Young Musicians (SAYM). 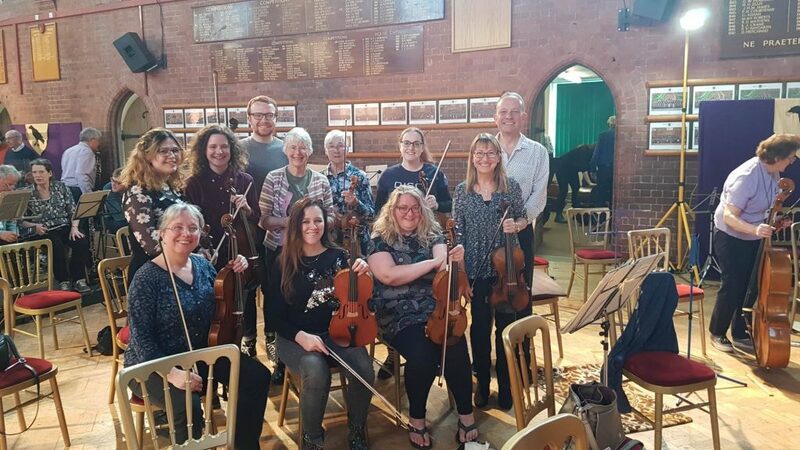 This organisation is run by dedicated volunteers and music teachers and holds weekly rehearsals offering the opportunity for young musicians of all abilities to play alongside others. 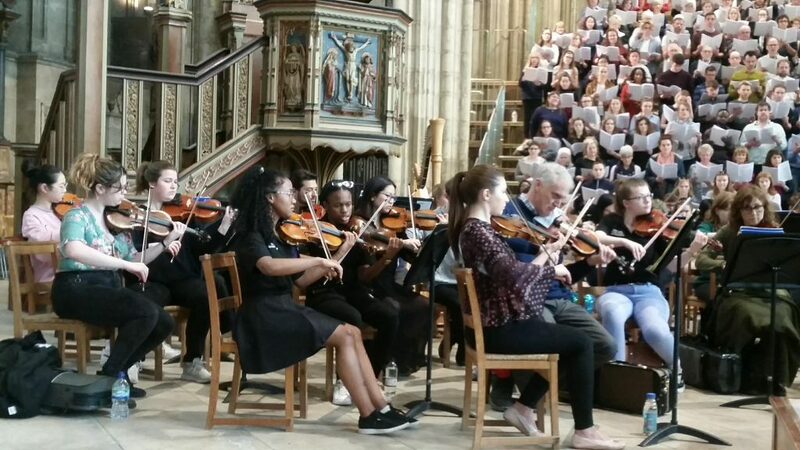 Over the years I progressed and developed, participating in regular public performances with the orchestras and choirs, which included singing at the Royal Albert Hall in London. 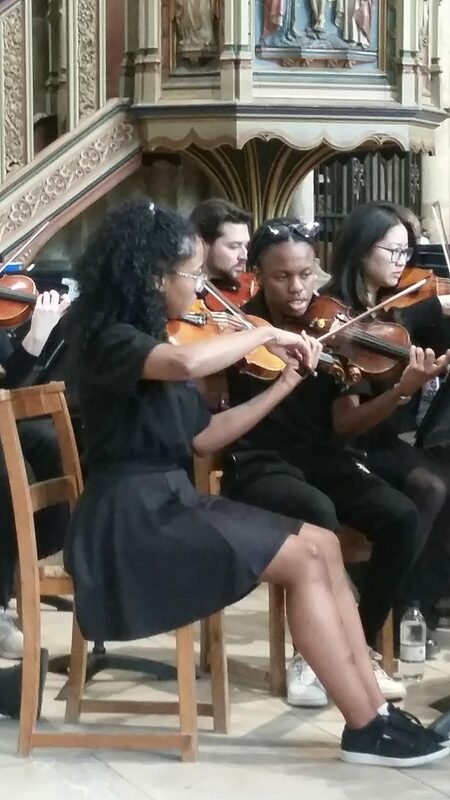 In addition to playing at SAYM, I also played the violin in my school orchestra, and sang in the school’s chamber and concert choirs. 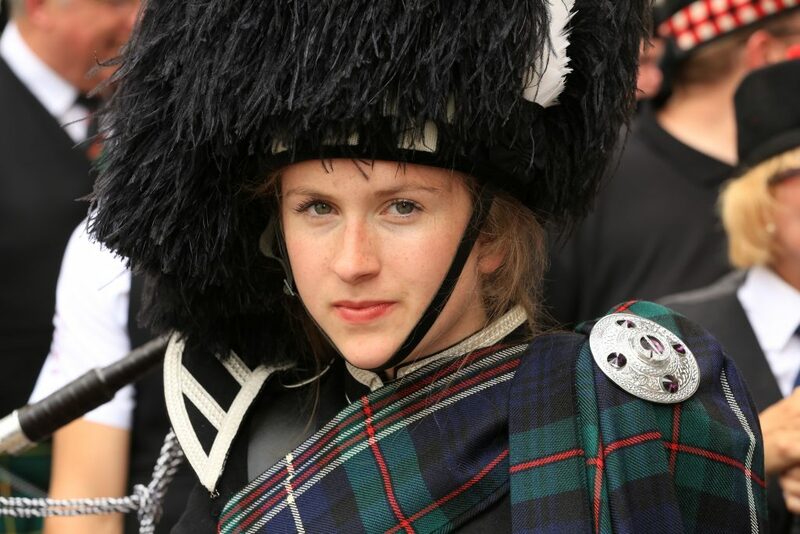 My passion for bagpiping began when I was 12. On a family trip to Scotland to visit my grandparents, they took me to see the Royal Military Tattoo in Edinburgh. Pipe bands play a significant role in this event and when the massed bands paraded in front of Edinburgh Castle it was an amazing feeling and it was great to listen to the different bands playing together. 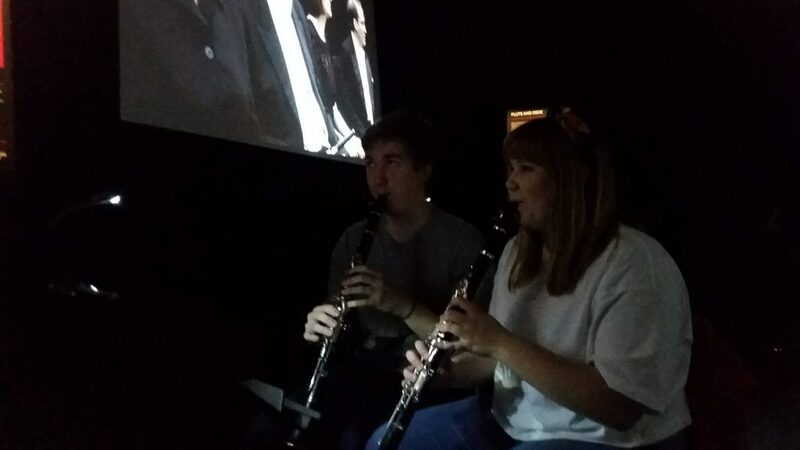 It was a musical experience far removed from what I did with SAYM and I rather fancied having a go for myself. 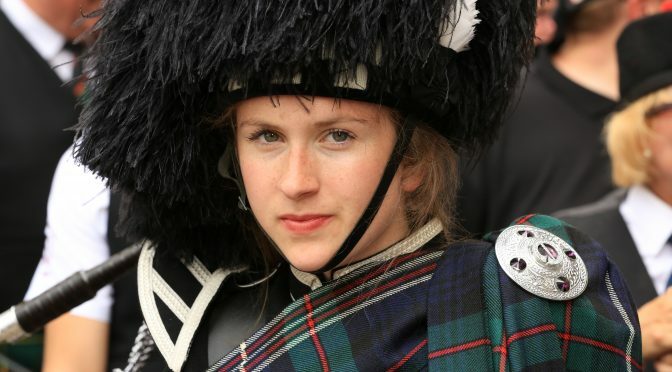 On returning home and watching the repeat on television, I commented that I would like to learn to play the bagpipes, and in September 2012 my brother and I started lessons on the chanter. As soon as we had reached a level of basic proficiency, we were introduced to the bagpipes and joined the Southern Jacobites Pipe Band. 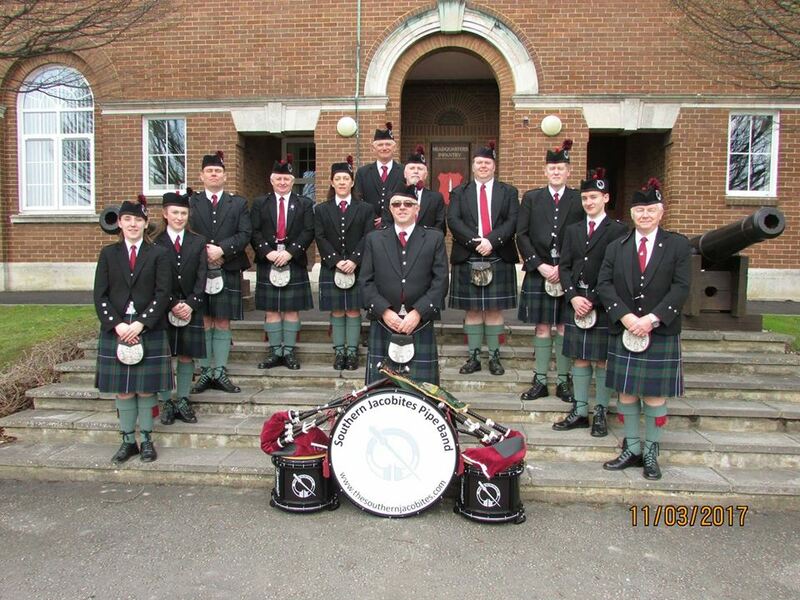 The Southern Jacobites is an active band and my first performance with them was in December 2013, at the Salisbury Christmas market. Since then, I have regularly taken part in band performances at carnivals, supporting parades and at private events. I have also been privileged enough to play with them at some unique events. In September 2014, the band performed with massed military musicians at the Tidworth Military Musical Pageant. 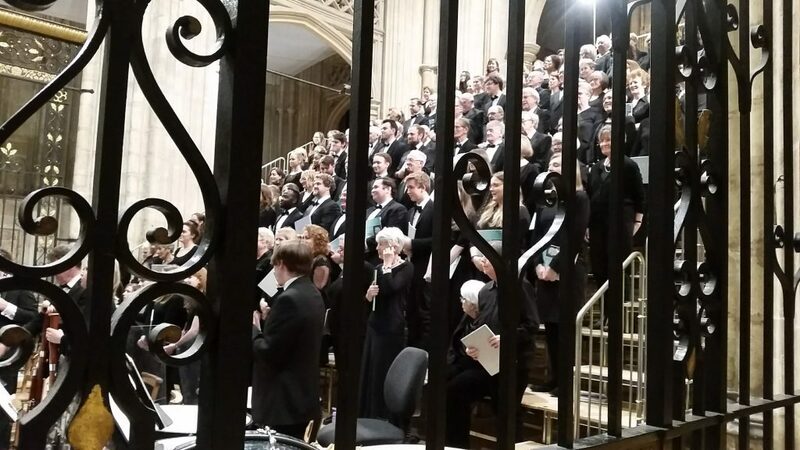 In 2016 we supported the Treorchy Male Voice Choir and in 2017 we played alongside the National Symphonic Orchestra at the Great British Prom at Bowood House. Each performance was very different and gave me an opportunity to play tunes alongside other instruments that weren’t just pipes and drums. That said, it is the traditional aspects of pipe music that has provided perhaps my most memorable experiences. The ’Big Bang and Blow’ is an event that takes place in London, in support of the Royal British Legion Poppy Appeal. Pipers and drummers from all over the country converge on London and perform together at various locations throughout the day. I have participated in this event twice, the second time travelling up after lectures here at the University. In a similar vein, but on a larger scale, in 2018 I travelled to Amiens in France to commemorate the centenary of the end of the First World War. 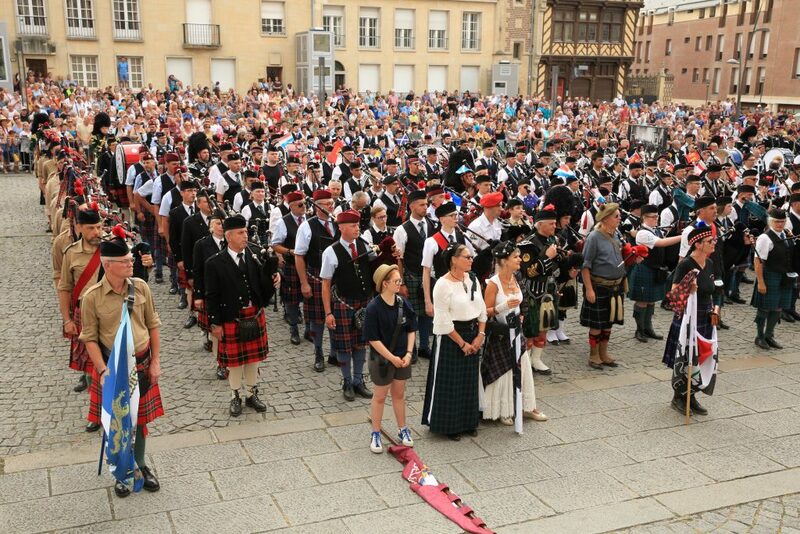 Pipe Bands from all over Europe attended the weekend, but I was one of many who attended as an individual and joined an international band, ‘The Lone Pipers’, which is formed of pipers and drummers from all around the world. This was a completely new experience for me, as there was no common language spoken and the only way to communicate was through the power of music. 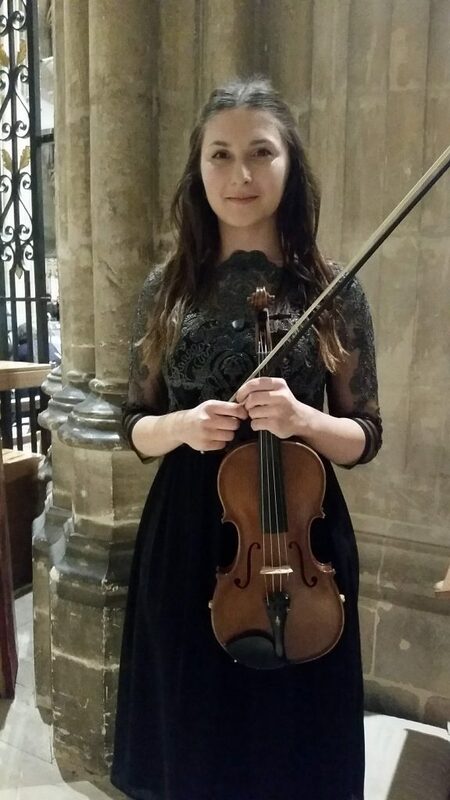 To be able to visit the grave of a relative killed at the Battle of the Somme before performing, as well as visiting the graves of many others gave the performance a more meaningful feeling and playing alongside all the other bands in front of Amiens Cathedral is a memory I will never forget. 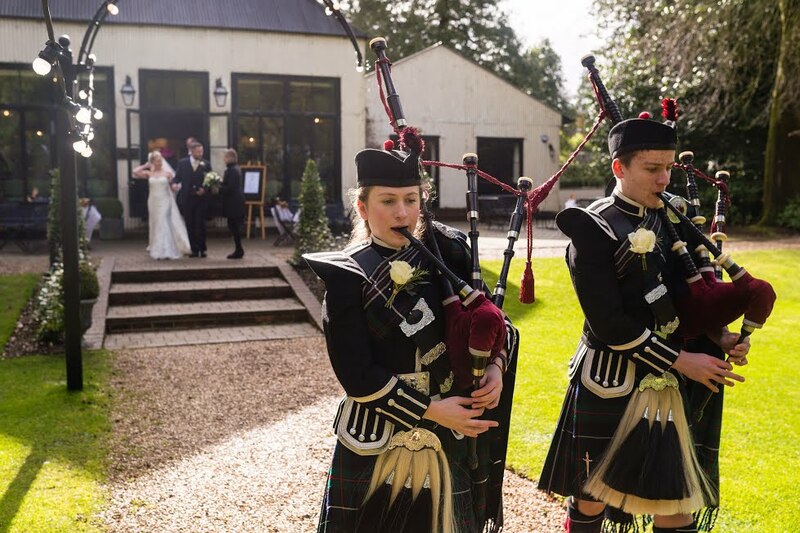 As well as performing as part of a band, I regularly perform both as a duet with my brother Hamish and as a soloist at weddings, parties, Burns’ Suppers and village fetes. 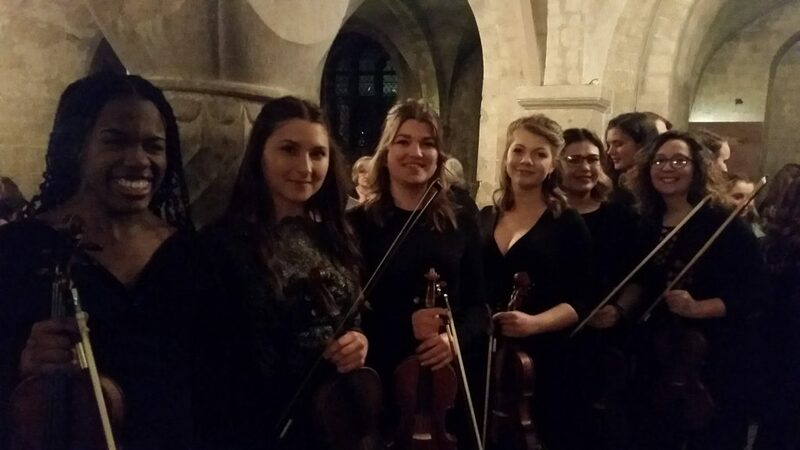 Perhaps my most prestigious engagement as a soloist, was playing at Devizes Castle for the 50th Birthday of the vice-president of HSBC America, which was attended by guests from as far afield as Australia. As well as playing traditional tunes, in my spare time I like to experiment playing styles of music that are not normally associated with the bagpipes. My inspiration for this came after seeing the ‘Red Hot Chilli Pipers’, a bagpipe rock band that plays contemporary pop and rock tunes, blending together pipes, drums, percussion and electric guitars. I have performed a rendition of ‘We Will Rock You’ at an Explorer Scout music festival and I am now learning some tunes by Queen. 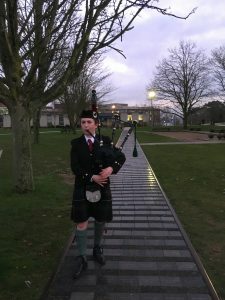 Since joining the University of Kent as a Bioscientist undergraduate student, I have performed outside the Gulbenkian for Burns’ Night (pictured, right) and I have joined the Glenduart Pipes and Drums, a competition pipe-band based in Folkestone. This is another new experience, as this band plays in a different style to the marching performances that I am used to doing with The Southern Jacobites. I am very grateful to be a recipient of the Music Scholarship, as it has allowed me to purchase a new bag for my bagpipes and has covered the travel and membership that I pay to practice with the Glenduart Pipes and Drum Band. 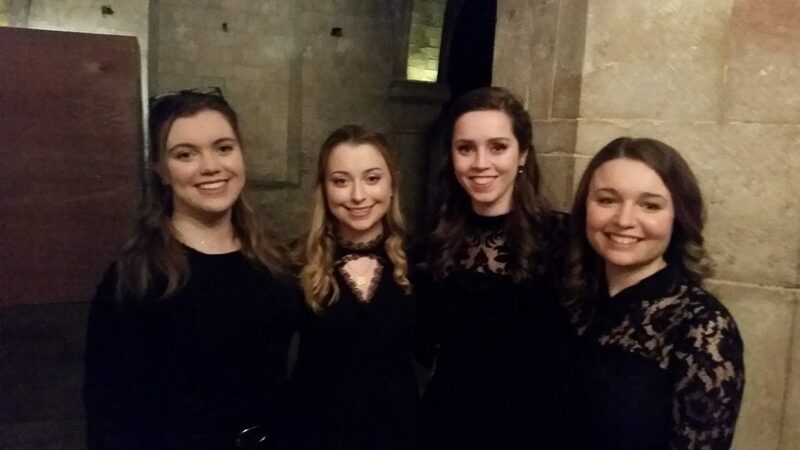 I hope to continue to showcase my performance as a soloist whilst here at the University of Kent, but also in the future play alongside some of the other musicians who are here at the University. 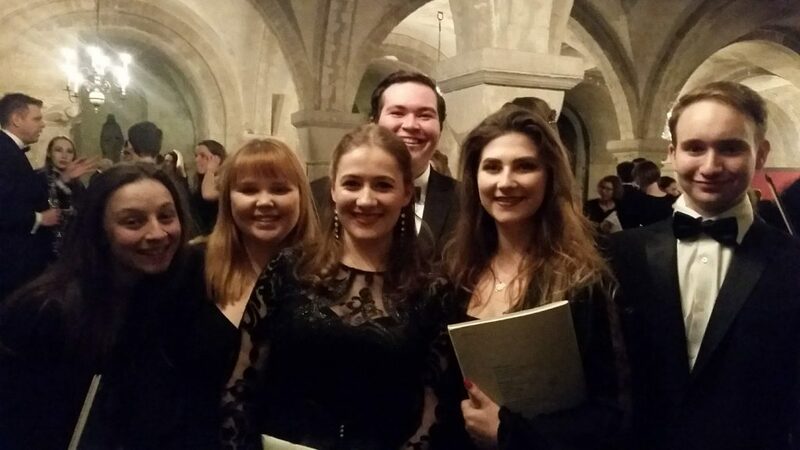 Congratulations to the Chamber Choir, which participated in an unusual event last Friday at St Michael’s Church, Hernhill. During the winter months, the church offers the opportunity to escape the pace of the Digital Age, and sit for an hour in a fifteenth-century venue by candlelight, listening to a sequence of music and silence as a means of creating a calm, meditative space in which to reflect and relax. 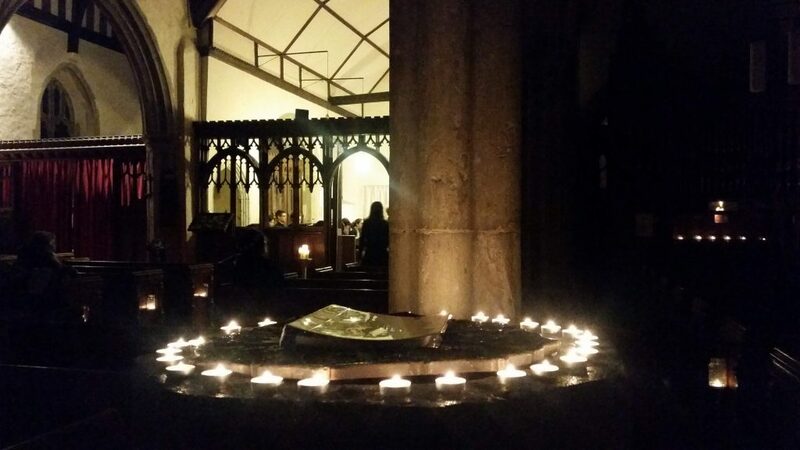 The Chamber Choir performed an evocative combination of choral music and silence by candlelight, creating a meditative space rich in contrasting colours. The church bell striking eight o’clock during a moment of silence partway through was especially atmospheric, matched by the sighing of the wind in the roof, the creaking of the ancient timbers and the guttering candle-flames dancing in the draughty dark. 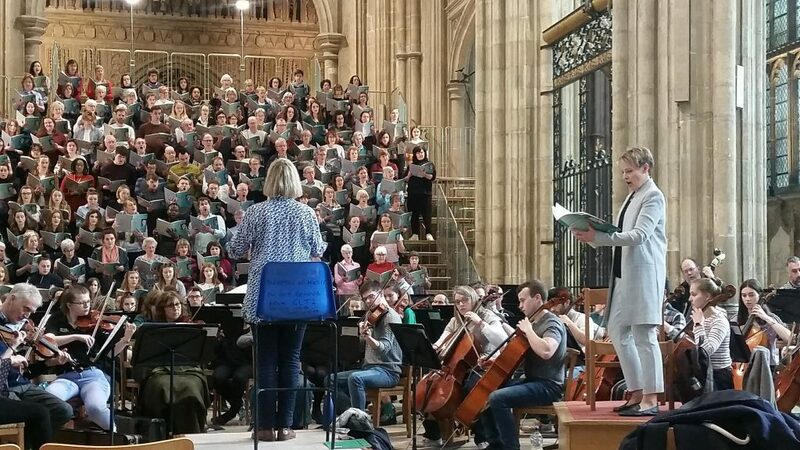 It’s been an action-packed musical week this week, with several events unfolding across three days. 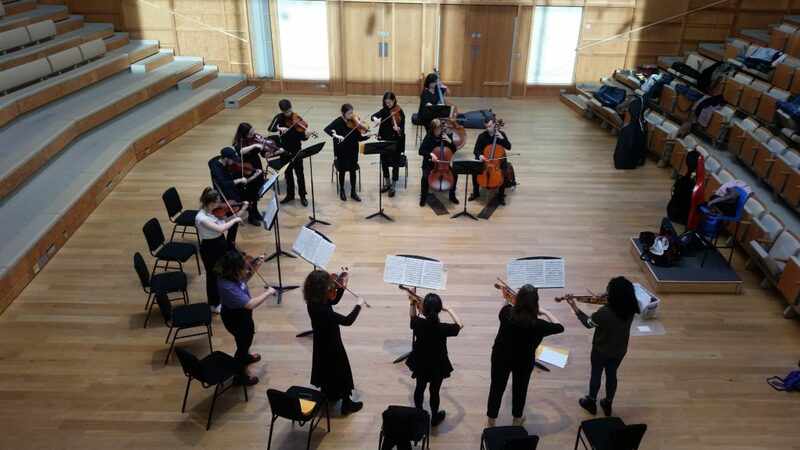 Yesterday, the string were in action once again as the String Sinfonia performed a tea-time concert of serenades, including works by Tchaikovsky, Mozart and Britten’s Simple Symphony. 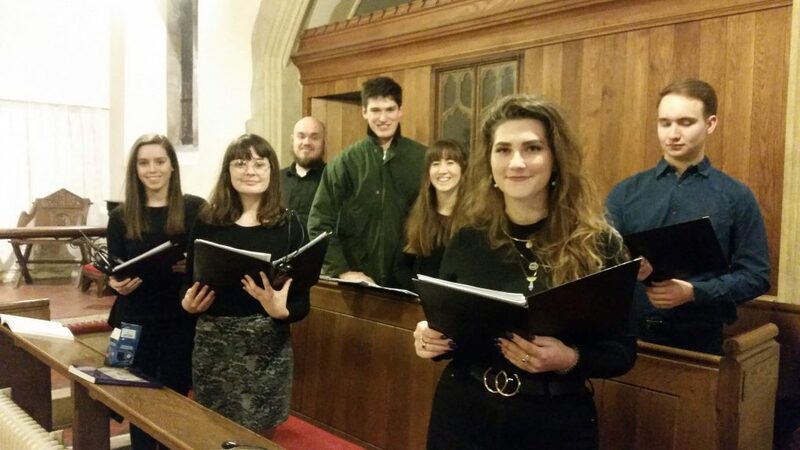 The action continues tonight, as the University Chamber Choir performs a meditative service by candlelight at St Michael’s Church, Hernhill, called Breathing Space, an hour-long event combining music and silence that creates a space for tranquility and reflection. The event starts at 7.30pm and is free, and draws the week to a close in an oasis of calm. Because it does. Doesn't it ? 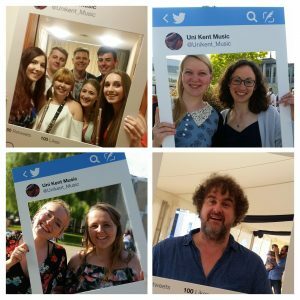 Blogging about extra-curricular musical life at the University of Kent. Was It Good For You ? 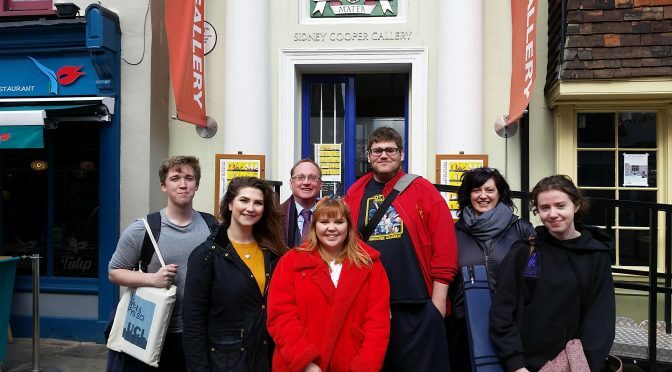 Sign up to receive our e-newsletter: a weekly round-up of top blog stories, plus occasional event previews: delivered straight to your Inbox!